Pope Francis will receive Turkish President Tayyip Erdogan in audience in the Vatican, on February 5, 2018, confirmed the Holy See, in response to questions by the press on this subject. The Holy Father spoke with President Erdogan by telephone on the morning of December 29, 2017. Paloma Garcia Ovejero, Vice-Director of the Holy See Press Office, pointed out that the conversation took place “at the initiative of the Turkish President,” without specifying the topics of the conversation. Several press organizations have mentioned the subject of the stability of the Middle East, after the announcement of the President of the United States to recognize Jerusalem as Israel’s capital, and to transfer the U.S. Embassy there on December 5, 2017. Other concerns of Pope Francis are also the migratory crisis and peace in the Middle East, particularly in Syria, the Pope stated during his address to the Diplomatic Corps accredited to the Holy See on Jan. 8, 2018. The conversation might also lead to Latin America, after the Pontiff’s trip to Chile and Peru, as the Turkish President will be going to Venezuela, Brazil and Paraguay. 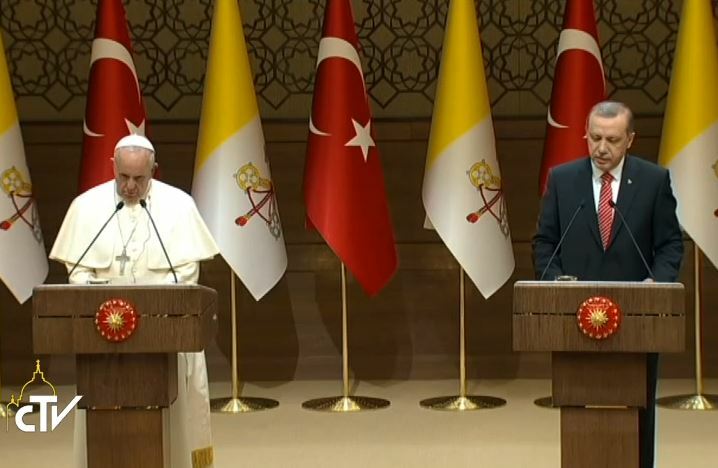 The Turkish President received Pope Francis at Ankara in November 2014. The President is coming, in a way, to return that visit. The Italian press noted that the last visit of a Turkish President to the Vatican goes back to that of Celal Bayar, received by Saint John XXIII in 1959. Angelo Roncalli, who had become Pope, was Apostolic Delegate in Turkey and Greece between 1935 and 1944, and had begun to learn Turkish.